The EAT-Lancet commission was portrayed as the product of 37 scientists from around the world. However, in reality, the authors represented a very narrow range of opinions: 31 out of the 37 (>80%) had established published records as being in favor of vegetarian/vegan or anti-meat diets. This includes seven from a Stockholm think tank (and EAT co-founder) dedicated to reducing/eliminating meat for environmental reasons. Thus, although readers are given the impression that the EAT authors have been objectively convened to comprehensively evaluate the science, the reality is that this group was one-sided from the start. Instead of grappling with the very real scientific controversies that exist on these topics, the group considered virtually none of the science that contradicts their views. On diet and health, the lead commissioner was Walter Willett, professor at the Harvard Chan School of Public Health, and his extensive, significant potential conflicts of interest are published in a separate, 8-page document here. It is also a matter of concern that none of the authors’ potential conflicts of interest were disclosed by The Lancet, an apparent violation of its standard disclosure policies. The EAT-Lancet diet is not only nutritionally deficient, it has been likened by some observers to the macrobiotic fad diets popular in the 1970s that resulted in severe protein and nutritional deficiencies. UK researcher Zoe Harcombe, Ph.D., analyzed the EAT-Lancet diet and found it to provide only 17% of retinol (needed for eye health), 5% of our Vitamin D needs, 22% of sodium, 67% of potassium, 55% of calcium, and 88% of iron. Yet low as these numbers are, they would be worse still if one were to factor in the reality that most of these nutrients are less “bio-available” to humans when consumed from plant rather than animal sources. The EAT diet is also deficient in Vitamin B12, which can only be obtained from animal foods. 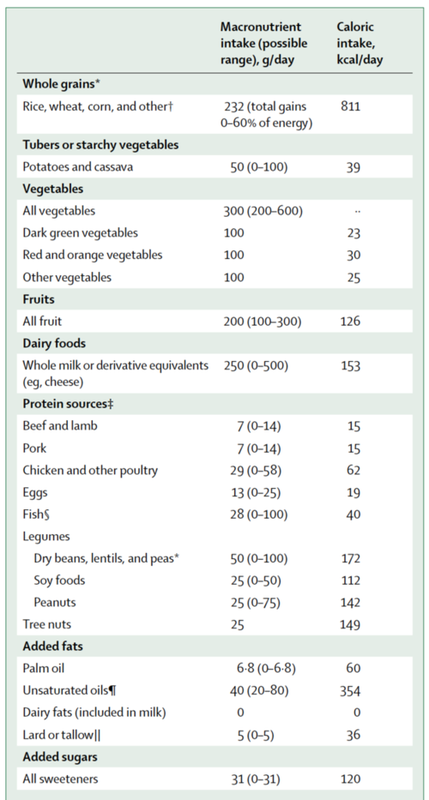 EAT’s note in the table below states that animal sources of protein can equally well be replaced with “plant proteins” but does not note that doing so would make the diet far more deficient in B12, which is crucial for the healthy growth and cognitive development of children, as well as the ongoing health of adults. Thus, this diet is fairly sure to lead to malnutrition and ill health. Read Harcombe’s blog post on the subject here. EAT-Lancet recommends .8g protein per kilogram of body weight, but many populations, including children, the overweight/obese, and most people over age 40, need more. Thus, the EAT-Lancet diet overlooks the majority of the world’s population. EAT-Lancet also recognizes that animal foods contain the most complete proteins, ideal for human growth and health yet does not recommend that people consume these superior proteins in significant amounts. Instead, EAT recommends incomplete plant protein sources, such as beans and nuts. “To get the same amount [30 grams] of protein in a 4oz steak (181 calories) you’d need to eat 12oz of kidney beans (almost one pound!) plus a cup of rice, which equals 638 calories, and 122g of carbs. Georgia Ede, MD, in Psychology Today, digs into the report and uncovers a number of uncomfortable facts. —Although the report says complete proteins cause cancer, it provides no evidence for that statement. EAT Diet Recommends A Fudge Pop Tart’s Worth of Sugar/Day? This does not appear to be a “more fruits and vegetables” report. Rather, EAT promotes 8 teaspoons of sugar a day, which is about the equivalent of a fudge pop tart. It also promotes 14% of calories as “unsaturated fats” which are defined as equal amounts of “olive, soybean, rapeseed, sunflower, and peanut oil.” Other than olive oil, these are all unnatural, industrial products that only entered the food supply about a century ago. Fourteen percent of calories in vegetable oils is far more than the average American now consumes. Mostly, EAT recommends massive amounts of grains (rice, wheat, corn, soy, etc). According to EAT, these should comprise fully one third, or 32% of daily calories. Some 51% of a person’s daily calories should be consumed as carbohydrates, says EAT, according to Harcombe’s calculations. Thus, we have a report recommending lots of wheat, rice, corn, soy and more sugar than most national guidelines. This diet is virtually toxic to people with diabetes or pre-diabetes and dangerously high in sugars for people struggling with obesity, heart diseases, fatty liver disease and other nutrition-related conditions. If not for the public health, then whom does this diet serve? EAT-Lancet was launched simultaneously in 40 cities with a massive PR budget. Who funded all this? All we know is that EAT has an extensive array of corporate partnerships. —About 20 Big Food companies, including Kellogg’s, Nestle, and PepsiCo. Note that the companies selling highly processed foods, like Nestle and Kellogg’s are essentially vegan. The vast majority of packaged foods sold on the inner aisles of supermarkets—cookies, crackers, chips (crisps), candy, cereals—are made up of the same basic ingredients: soy, corn, grains, sugars, and salt. This is vegan. These companies would presumably like nothing more than to put a big green V on their packages to give them a reason to advertise their foods as healthy. Meanwhile, the pharmaceutical companies profit from selling drugs, insulin, and devices that sick people need. Would these companies be backing EAT if this diet were to genuinely improve health, reduce disease, and thus, shrink their profits? It’s hard to imagine. What is the interest of these companies in supporting a report targeting animal agriculture as the main driver of global warming if not—perhaps—to displace attention away from their own polluting activities? Or perhaps they make the pesticides that grow crops. One cannot know the answer to all these questions, but the massive level of corporate backing clearly raises serious questions about the interests behind this report, especially when there is no rigorous evidence to support the idea that this diet promotes human health and quite a bit of evidence to show that it causes harm. Thanks to Belinda Fettke and her article for this find. One could ask, further, about the GHG emitted by the whole EAT-Lancet project. Thirty-seven authors from 16 countries were gathered together for at least two scientific meetings, followed in 2019 by at least 5 “launch” meetings by the Commission, as well as a further massive roll-out last week in 35 sites worldwide. A second EAT-Lancet paper, released January 27th, involved 43 authors from countries around the globe, who were gathered for 9 “workshops” and 3 meetings in various locations worldwide. How much GHG was required to enable all this travel? Although many researchers claim that planes, trains, and automobiles do not produce as much greenhouse gases as do cows, there are contrary views on this topic. For instance, as the Food and Agriculture Organization recently pointed out, the GHG of livestock have been calculated to include both direct and indirect costs, whereas the transport sector has been analyzed looking only at direct costs. I’m not an expert in the environmental issues here, but this does seem like a worrisome oversight. 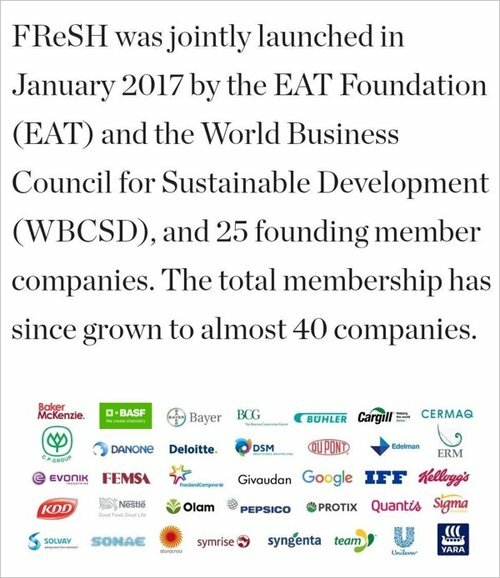 Among the complex network of funders behind EAT, the Wellcome Trust is a principal one, for the report’s scientific component (as opposed to the worldwide PR). The trust, with $29.2 billion in assets, is funded by the Wellcome family and its pharmaceutical fortune. This family also has a three-generation history in the 7th Day Adventist Church, including a member—the father of the trust’s founder—who was a church elder. The 7th Day Adventist Church promotes vegetarianism as part of its religious beliefs and has pursued an aggressive mission to spread these beliefs and practices around the world. This raises the disturbing question of whether a religious agenda might be informing the EAT-Lancet report. Because meat taxes seems to be the intervention of choice, stay tuned for those… and other measures intervening in our daily choices about what to eat. In all, EAT-Lancet has every indication of being the product of international industrialist interests, from processed food companies, whose products provoke nutrition-related diseases, to pharmaceutical companies, whose profits are fueled by those diseases, to the world’s chemical companies, whose interests in environmental well-being are elusive. The common cause of these industries appears now to be scapegoating meat for all environmental and health ills. And they have found willing advocates in the committed, idealistic vegans and environmentalists who deeply believe in these solutions. We should return to the fundamentals of good science. Establishing policy based on weak science leads to unintended consequences as we’ve seen time and again—with the mistaken policies recommending hormone replacement therapy, caps on cholesterol, and more. Such policies actually ended up causing far more harm than good, as the EAT diet seems bound to do. What does the rigorous science say about the best way to reverse the epidemics of obesity and diabetes (and more) now crippling our nations? The rigorous evidence does not support a near-vegan diet. The answer must include animal foods, since they naturally contain the nutrients needed for healthy human growth and development. Our way forward should be to gather a group of experts who could objectively identify the rigorous clinical trial data on healthy diets, and then work together to make those diets sustainable.